Purchase a luxurious tub from A-Z Appliance Heating and Cooling! 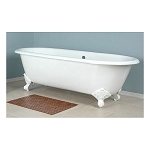 We carry free standing, claw foot, skirted tubs, walk in tubs, tubs with bases and more! We ship these tubs and more throughout Winston-Salem, NC, Greensboro, NC, High Point, NC, Salisbury, NC and surrounding communities.